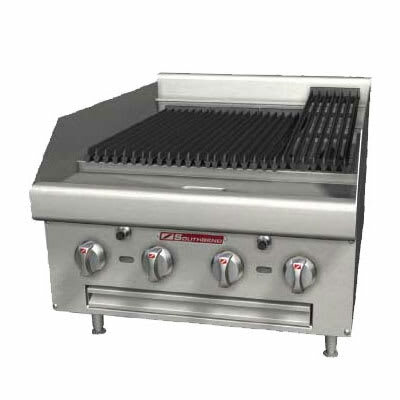 The Southbend HDC-48 gas charbroiler has eight stainless steel burners that are evenly spread across the cooking surface. These burners are controlled independently, so operators can precisely control the temperature across the cook top. Adjustable to two positions for a variety of applications, the cooking grid can be used on both sides, and 5-inch rear and side splash guards keep liquids contained to the surface. Front and sides are made of stainless steel for corrosion, dent, and scratch resistance, while the aluminized steel rear and bottom withstand heavy-duty use. The unit can be converted from radiant cooking to briquette cooking. Our countertop cooking equipment buyers' guide has in-depth information on charbroilers and other countertop equipment.